3) Plan other collaborative activities among members and non-members of the SC4 Network. – Chapter proposition: the SC4 Network will edit a book about “Industry and Supply Chain 4.0”. Selected manuscripts from the symposium will be invited to submit a full-paper document to compose the book. Targeted publication date: January 2018. More information can be found at the end of this document in the Section “Further Publication”. We will make use of videoconferences to allow participants to be virtually present, in case physical presence is not possible. Unicamp – University of Campinas, Campus of Limeira, less than 2 hours driving from São Paulo, Brazil. Authors presenting during thematic sessions must use Skype account, with a headphone to avoid microphone reverse sound. Please, connect to “reservasala” one hour before the presentation. Please indicate the choice of paper type in the mail message during the submission process. Types: i) research paper or ii) chapter proposition. 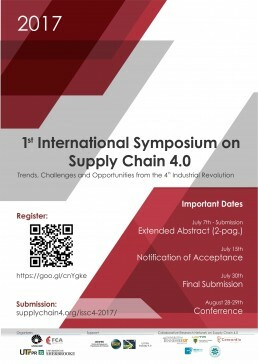 – Selected manuscripts will be invited to submit a full-paper to compose a book about “Industry and Supply Chain 4.0”. – Targeted publication date: January 2018. – Objective: to provide basic reference supporting undergraduate and graduate students to understand Industry 4.0 in general and its impact on supply chains. – Topics of interest include, but are not limited to: fundamentals (origins and historical perspectives, definitions and concepts, principles, components and technologies from the physical, digital and biological worlds), applications (e.g. smart factories, smart logistics, smart farms, etc. ), emerging and trending business models, challenges and opportunities (management structure, workforce, etc. ), digital maturity, methodologies (e.g. where and how to start the transformation process), impacts on business models, distribution, consumption, successful cases and experiences, legal aspects, connection to traditional concepts in Operations Management (e.g. smart lean, international standards) and so forth. Giocondo César, Paulo Ignacio, Ieda Kanashiro, Alessandro Silva, Antonio Carlos Pacagnella Júnior and Luis Antonio de Santa-Eulalia. Elaine Mosconi, Anjali Awasthi, Rupy Sawhney, Rui Yoshino and Luis Antonio de Santa-Eulalia. Fabiane Alves, Felipe Santana, Victor Machado, Juliana Camatti.